Press-your-luck is a venerable category among games with many distinguished entries. King among these is the 1980 Can’t Stop by the also venerated Sid Sackson. It is a must-play for those with an interest in dice rollers like Yahtzee, Pickomino, or Plucky Pilots and those with a similar interest in other luck-pressing games like Duck, Duck, Bruce. Can’t Stop’s roots lie in intriguing mathematical concepts that have engaged many minds. Sugar Pill Studios posted an extensive analysis of Can’t Stop probabilities while giving gamer and Boardgamegeek member Rob Igo created a handy reference sheet, and Michael Keller’s analysis advises us to invoke his Rule of 28. Can’t stop is educational without being “edumacational;” It can teach basic arithmetic and basic combinations, It can teach nonuniform distributions and conditional probability. Divide them into two pairs and add the numbers. Place/advance markers on these numbers if you can. If you can’t, remove your progress and pass the dice. Would you like to roll again? The essential constraints come from rules 2 and 3. Rule 2 dictates that the four dice must be summed into two pairs and no other configuration. For the casual player, this keeps the number of configurations small and manageable–3 at most. For the gamer, this gives us the kinds of limited options we simultaneously dread and adore. Rule 3 transforms rule 4 from a trivial decision to an agonizing one. Look how far I’ve gone! Surely I can go to the top! Or can I? One failed roll could cost me everything I’ve accomplished! The gambler in us says to keep rolling while our inner pessimist screams to stop! One other element makes Can’t Stop stand out from many of its luck pressing peers–it can be won on a single turn. This element should be mandatory to any game designed in the genre. No matter how remote the odds may be at any moment, no matter how bad your placement, it is always possible to hit a hot streak and pull a win. This is the key–that knowledge that you could win on your next turn if your luck is with you–that will keep you in the game right to the last moment. How some luck pressers choose to omit this element is quite honestly beyond me. Can’t Stop is the avatar of press-your-luck games. It is accessible and yet deep. It is clear and yet confounding. It gives us the thrills and the agonizing decisions to keep us bringing it back to the table for years, long after many of its contemporaries have been consigned away in garage sales and second-hand stores. It is excellent. What are the landmark games? Which titles should every game enthusiast play at least once? Can’t Stop is my suggestion. 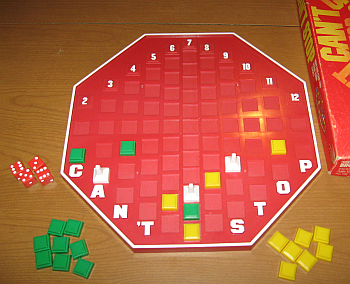 Have you played Can’t Stop? What do you think of it as a landmark game? What other games do you see as notable ancestors to newer games? Share with your fellow readers in the comments below. And if you’re enjoying what you’re reading, create and account with WordPress and follow this blog. If you keep reading, I’ll keep writing. Design partner Luther Bell Hendricks V, development phenom John Eyster, and I had the pleasure of attending Gen Con 2014 last week. While that delightful annual roller coaster deposited most folks back into their normal lives gently, like the babbling stream at the foot of a waterfall, it was merely one of the loops in the roller coaster of August for us teachers. My classroom is now prepped, I’m settled in and ready for those smiling faces to arrive Monday and that means it’s time to get back to the important business of blogging! A few days before departing for Gen Con, three of us checked out Marvel’s newest blockbuster. 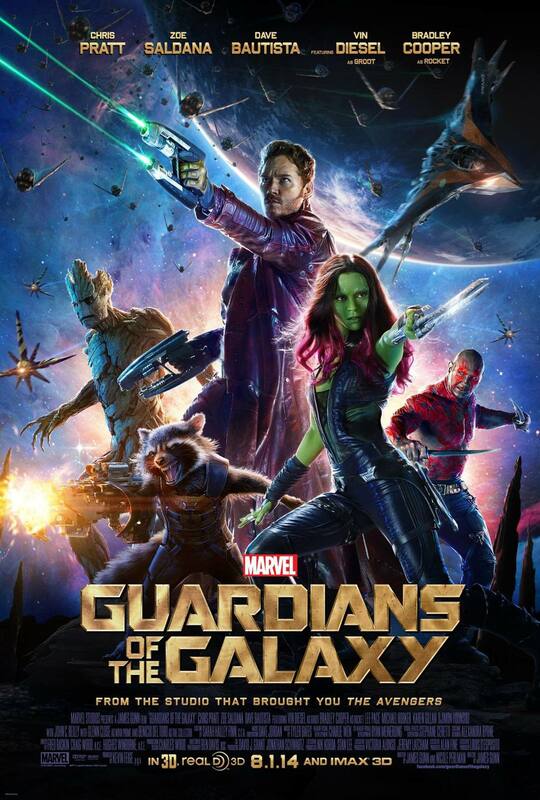 Chris Pratt was a familiar face from Parks & Recreation, the Guardians were familiar from their comic appearances in the 1970s and 80s, I’d noticed at my FLGS that Marvel rebooted them in comic form (presumably to build anticipation for the film) and wondered how they’d do on the big screen. Folks, this was worth it. Action? Yes. Adventure? Yes. Space Opera? Yup. Is it perfect? Hardly. Lee Pace was wasted on that glowering cardboard cutout of a villain. It is worth your time to see? Definitely. Were I of a mind to develop alternate characters for Sentinel Tactics, these Guardians are be the ones I’d do. Our main purpose at Gen Con was to promote Sentinel Tactics and it’s thrilling to say that it was well received. Our central objective has always been to give players a new way to interact with the Sentinels setting and it looks like we succeeded. While the game may not have the broad appeal of some other titles *cough* X-Wing *cough* its core audience was thrilled. Some players delighted at the opportunity to play a villain. Some appreciated a chance to scratch their wargaming itch with Sentinels-playing friends. 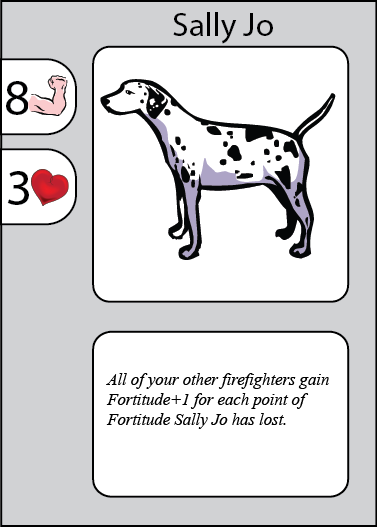 One was so enthusiastic that he posted a strategy guide for the scenario we’d been running! 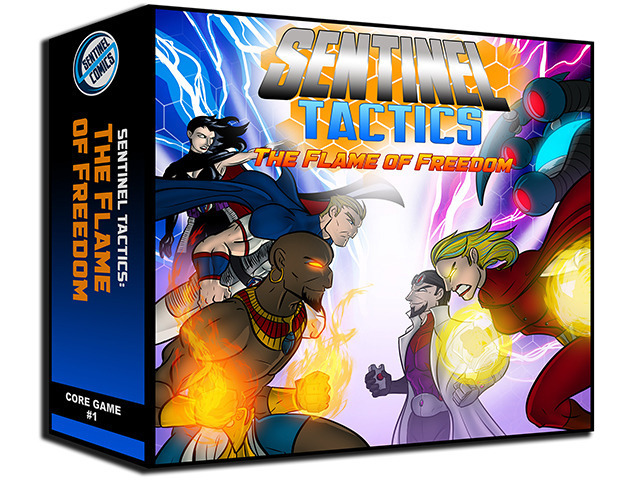 Christopher Badell and I had a chance to sit down with W. Eric Martin of BGG for a Geek Speak about Sentinel Tactics and I promise to add a link here just as soon as it’s up. If you haven’t had a chance to get a good look at the components yet, this will be a good way to do it. In addition to Sentinel Tactics, APE Games released their Rolling Freight Expansion #1. This expansion offers a new power into the Rolling Freight system and three new map features. It’s fans seemed quite happy with it and I’m doubly eager to see the response to Expansion #2 (scheduled for next year) which offers two more maps, this time streamlined for two players. Kevin Brusky (Mr. APE Games) and I had an opportunity to speak with The Spiel (link tba) and I promise to add a link here just as soon as it’s up. We elected to reveal another game I’m developing for APE during that interview. the working title is “Muster & Battle” and I’ll be blogging about it here soon. On another happy front, we took several meetings with publishers in the evenings and have come away with some exciting new projects. I’m not free to discuss them publicly *yet* but details will be coming soon, I promise. Every year, I pour through the convention previews and assemble a “must look at” list. This year turned out to be an exceptionally good year for conversions to the “must buy” list. I can’t offer any complete reviews here but will mention a few of the stars and why I liked them. HABA is easily one of my favorite game companies. They make solid kid-friendly games that still feature intelligent, meaningful choices. It was a major delight to see HABA USA decide to have a booth at Gen Con. When I dropped by, the staff was delightfully cheerful and busy. Lea Culliton tells me that not only will they be back next year, they will likely double their booth size. 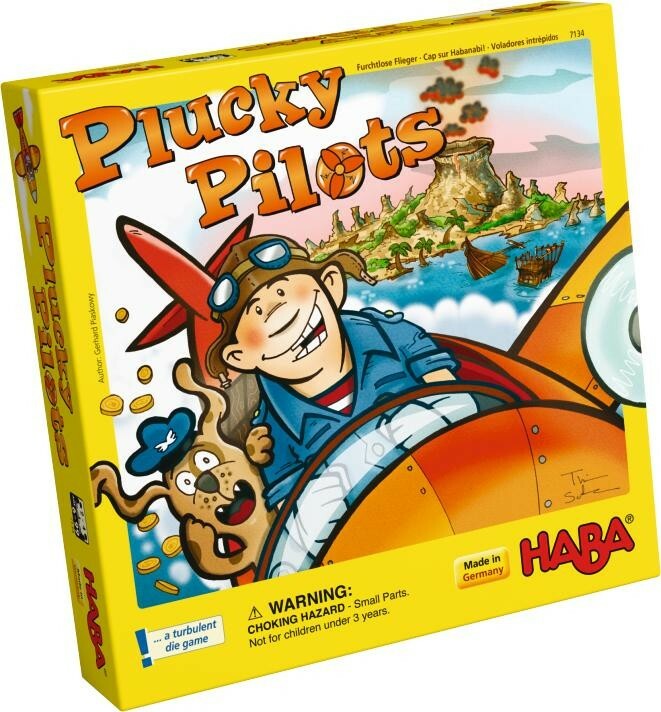 Haba had several new games on display and I elected to bring home a copy of Plucky Pilots for its press-your-luck mechanism and general sense of whimsy. The Asmodee booth had several good games on offer but after a short demo with codesigners Bruno Cathala and Charles Chevallier, it was clear that Abyss offered an economic model and gameplay which made it the one to grab. Always clever at pulling money from my pocket, IB&C debuted Dragon Slayer, a dice game at a price I could not refuse. 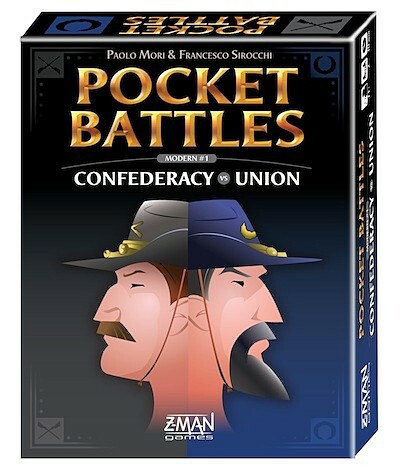 It was in 2009 that Z-Man Games first released a Pocket Battles game. In my ignorance, it wasn’t until 2013 that I tried one of them out and discovered what a little gem I’d been missing. Fortunately for me, they put the original three back into print alongside the newest entry in the series, Confederacy vs. Union. The pocket battles series is a perfect example of what I’ve tried to accomplish in my own game designs–a place for both strategic and tactical decisions, clear rules, fast play. Did you make it to any conventions this summer? Which ones? What was your favorite game? Who was the most interesting person you met? Share with your fellow readers in the comments below. And if you’re enjoying what you’re reading, create an account with WordPress and follow this blog. You keep reading. I’ll keep writing. We have taken a look at several categories of trigger and effect, including several from our insightful readers. We have also taken a look at four different combinations and suggested a game which might might best serve each. For reference, here is our working list of triggers and events. Let’s try four more combinations. 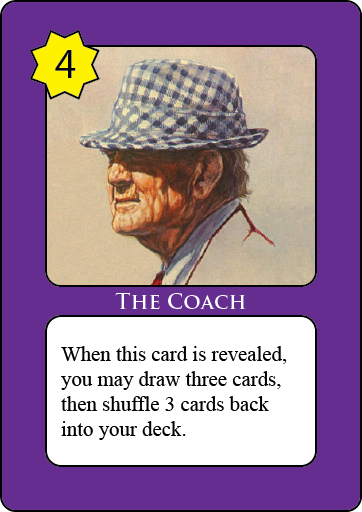 Here’s another combination that feels right for Duel. Since battles can last over several plays, it would be interesting to create a card that grants cardplay each time it is damaged. One of the deck concepts being developed for this game is “Gamers” and the idea of playing cards each time one of your cards is damaged certainly seems like a gamer-y kind of effect to me. TCG Player is my attempt at such a combination. 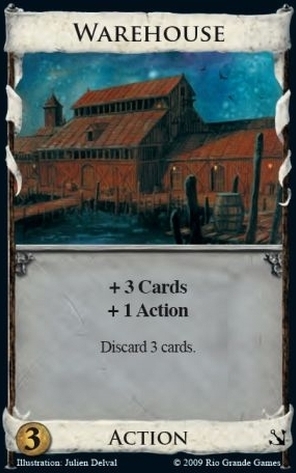 Strength is fairly high in Duel–to date, there are only two cards in nine decks with Strength greater than 10–so this should ensure that its ability kicks off at about twice on the average. 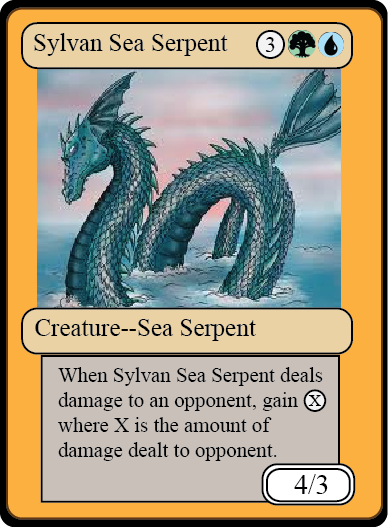 Since this card’s ability is reactive, there’s also good incentive to play it face down to entrap your opponent rather than simply playing it for its Strength. 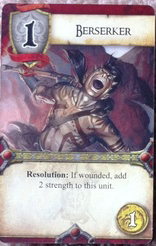 Taking a second look at the card, there’s a rising concern that this card is overpowered. Playtest will confirm or refute this concern of course. Should the card indeed be too powerful, there are multiple ways to address the issue. 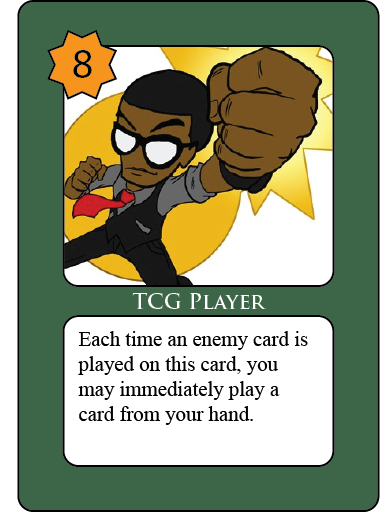 The TCG Player could be weakened or it could be left strong while the other elements of the deck are weakened to counterbalance its power. This combination evokes thoughts of a card-driven political tension game and Twilight Struggle by Ananda Gupta/Jason Matthews is one of the classics. 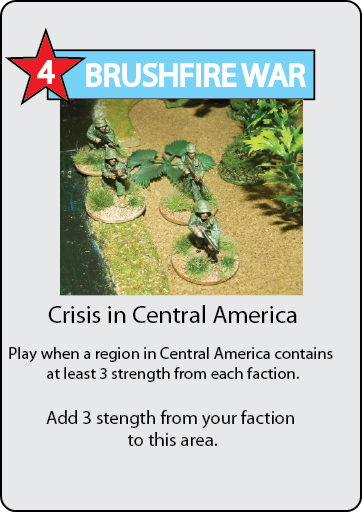 I confess that it’s been a few years since I’ve had the opportunity to enjoy this game but I believe a card of this type might look something like this Brushfire War. This combination makes me think of a two player card-driven game about breaking out of prison. Perhaps it’s because we recently saw Guardians of the Galaxy and its delightful prison break sequence? In any case, one player will play the guards while the other plays the inmates. 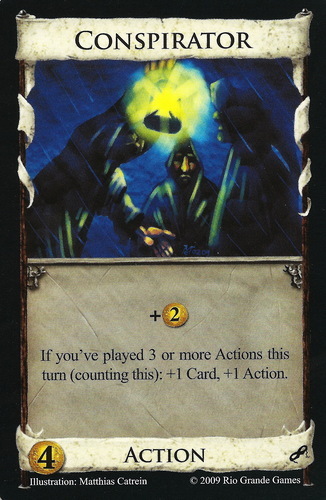 In an environment like this one, the Guard player’s deck would likely include a number of cards which counter Prisoner player’s cards or force the Prisoner to discard cards. A classic trope of the prison break movie is the moment at which the prisoners subvert the Guards standard operating procedure, turning their plans against them. In this spirit, we give the Prisoner deck this Right On Schedule card. 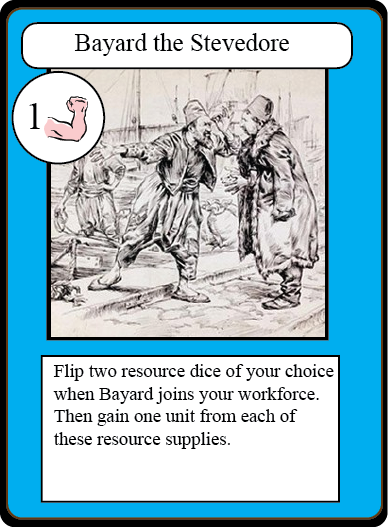 The idea for a theme is somewhat thin on this one but how about a worker placement/blind auction/deckbuilding hybrid in which the workers are cards? In the majority of worker placement games, all workers are identical (Leonardo da Vinci and my own Zong Shi are exceptions) but if workers were cards, they could vary quite a bit. 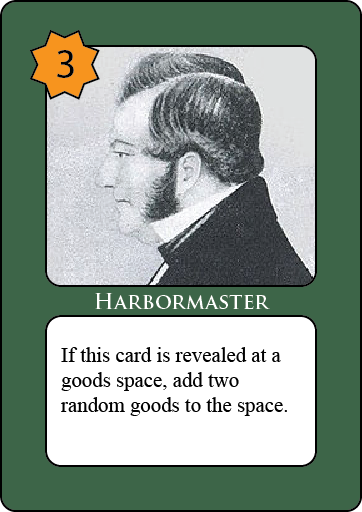 One card players can acquire in this environment might be our Harbormaster shown here. Continuing our back to school adventures, here’s another a nice homework assignment for you. This time, I’m giving you the trigger, the event, AND the type of game this trigger must be used in. See what you can think up and submit your ideas to our comment section. Constraints breed creativity. Go for it–you can do it! In addition to back to school season, it’s also Gen Con season! Luther, John and I will be in attendance, primarily at Greater Than Games–booth 1949. We’ll be running demos of Sentinel Tactics all weekend. Come by, say hello, and let’s play a game! We have now looked at eight of my “when TRIGGER occurs, do EVENT” examples. How did I do? What combination did you find most interesting? What made you like it so much? Which one did you like least? What keeps it from being more enjoyable? Share with your fellow readers in the comments below. And if you’re enjoying what you’re reading, create an account with WordPress (http://wordpress.com/) and follow this blog. You keep reading. I’ll keep writing. 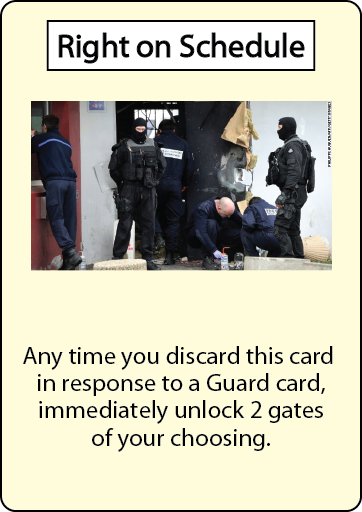 Part one of this series identified six categories of trigger–Entrance, Tap/Untap, Exit, Acquisition, Revelation, and Damage to the Card. 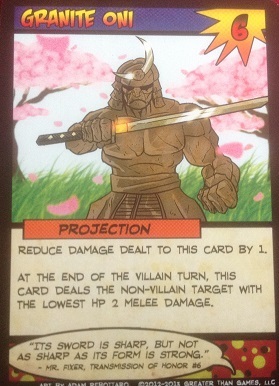 I also pointed out that any of these effects could use the opponent as the trigger rather than the card holder. I also challenged readers to identify any triggers I missed. Several astute readers took on my challenge, identified missing triggers, and shared them in the comments section. Jacob Titus Sanders pointed out that while I had discussed damage dealt to a card, I had completely overlooked damage dealt by the card. Readers Rob and willbanalog pointed to resolution mechanisms–the “stack” for triggered effects found in M:tG and the immediacy of triggered effects in Marvel Dice Masters. 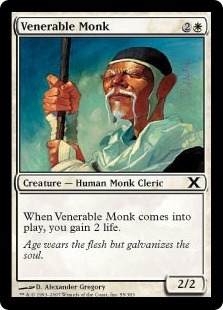 Regular reader, frequent contributor, and all-around spiffy dude Carl Klutzke remarked that triggered effects could be used to clean up otherwise wordy card effects. Carl, we’d love to see a few specific examples from you. Triggered card effects fit under the “when TRIGGER occurs, do EVENT” umbrella. Having taken a revised look at the variety of triggers that exist, we now begin a take on the other half–effects. 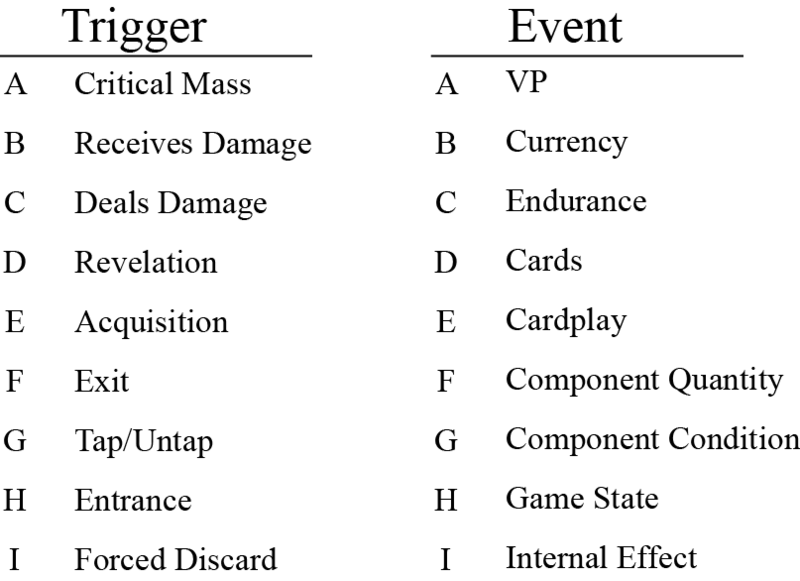 These are the first five card effect categories in our look at the “when TRIGGER occurs, do EVENT” formula. Next time, we go after the rest. See you Monday! What effects did I leave out? If so, what were they? What game triggers do you find most interesting? What made you like it so much? What game triggers do you dislike? What keeps it from being more enjoyable? Share with your fellow readers in the comments below. And if you’re enjoying what you’re reading, create an account with WordPress and follow this blog. You keep reading. I’ll keep writing.